At whatever a.m. your alarm clock rings, you should be up and running all day long or for a decent part of the day for sure. Most occupations nowadays include running, either a morning sprint to office or a steeplechase at the hospital, restaurant, kindergarten or sports club. Even if you are self-employed and work at home, a little jogging happens, doesn’t it? It’s quite easy for people with normal or medium arch to pick right shoes – they just select the ones that suit their budget. When it comes to lucky owners of high arch, shoes for everyday occasions are problematic still possible to find. There are no two identical persons, but still many people worldwide, both men and women, share the least common foot type, namely high arch or cavus foot. Let’s try an amusing, still effective wet foot test to see your foot type with your own eyes. It will take you a minute or two. Wet your foot with warm water and press it tightly to the paper surface. Wait for about a second and see the results. The footprint with normal arch offers an ideal picture where forefoot and the heel are joined by quite a wide band. It is the most common foot type. If you see no gentle relief between the tiptoe area and your heel, you have flat or low arch type. And, finally, if your heel and forefoot are connected with a barely noticed thin band, you have high arch. 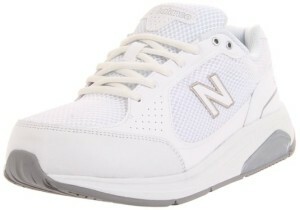 Running shoes for this type are specially designed for convenient and healthy movements. Depending on how serious the problem with your arch is, if you have diabetes or other health related problems, you require a special type of footwear. It’s hard to say for sure who runs the most – women or men. Still ladies come first, so check the top sellers and female shoe leaders according to numerous customers’ reviews. This model has passed a special ‘road test’ with the highest grades. US sportswear and goods manufacturer Saucony is famous world-wide and offers a variety of professionally designed footwear for high arch. 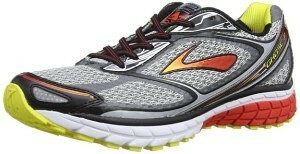 Brooks Ghost 7 is a beloved model according to sports magazines’ and editors’ reviews. Brooks Sports, Inc. is one of the US manufacturers who deal with running shoes. 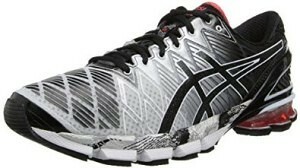 Japanese sports footwear and accessories company ASICS is a brand of top quality. However, it sticks to a rather high pricing policy. Being the American leader of professional athletic footwear, ‘New Balance’ has firmly established itself as market front-runner. However, even the best running shoe for high arches does not match an evening dress or formal style, so shoes with high heels also take a decent part in every lady’s wardrobe. Actually this type of shoes is the only one to match high arch perfectly as it repeats the foot’s shape. The problem lies in the height of the heels. If it is more than 3 cm, additional pressure in the ball of the foot occurs. That’s why be advised to give preference to more supportive shoes or not so high heels. If you shift from casual footwear to the evening one, try a little calf massage for better blood circulation in order to reduce the effect of ‘tired legs’. 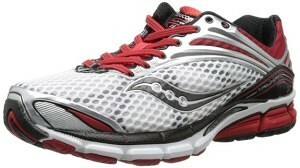 The only shopping any man can stand is the one when he is looking for an ideal pair of running shoes. Indeed, it can take much longer than any other purchase, still this choice is always profound and careful. 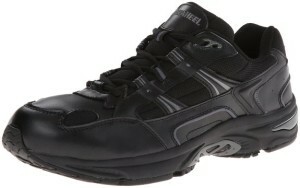 Check the top sellers among running shoes for men with high arch foot type. The modern shoe market offers a large number of shoes for high arches both for women and men to suit any road you walk, work you are doing and budget. Just spend some time on little research and enjoy painless and healthy walking or running. High arches cases are rarer than flat feet ones and are caused by neurological or orthopedic conditions. Unfortunately, high arch may cause disability with time. Symptoms that include difficulty when fitting footwear as well as pain while standing and walking should be discussed with your doctor. He/she will decide if additional tests are required like MRI of the spine and feet X-ray. Still all doctors agree that flexible high arch cases do not require special treatment if you care about your feet well and wear correct shoes. The best shoes for high arches presented above meet all the recommendations and match any taste and pocket. Just choose the best ones for you and enjoy your everyday activities. Good blog you1#82&7;ve got here.. ItÃ¢Â€Â™s difficult to find quality writing like yours these days. I really appreciate people like you! Take care! !